Thanks for your interest in our Cadillac Classic Car Showcase page! The main purpose of this page (and our other vintage automobile pages) is to show our customers, past and present, what we can do! If you are in need of wheel covers to give your classic car that final touch, Hubcaps.com can help! Our on site restoration department has years of experience making hub caps that are anywhere from 10 to 20 to 60 years old look brand new! Cadillac itself is a luxury car make that was started by General Motors in 1902 and has a solid place in automobile history. Coincidentally, Cadillac produced its 1 millionth car in 1949 in the midst of post World War II America. Today, the pulse of the Caddy is still vibrant and strong so those of you looking for a wheel cover or hubcap can find what you need right here at Hubcaps.com! 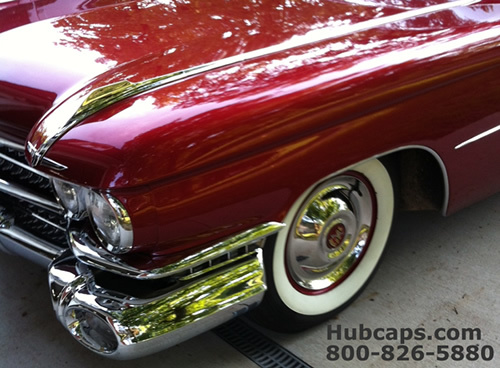 Please take a look at the 1959 Cadillac Coupe DeVille that now has fully restored hub caps to add that last special touch. For those of you who love the quality of work we can produce, contact us for more information. Click to learn more!